Raaga.com: Rare Moments when Bollywood Titans came together! It is everybody’s desire to click a picture with star of millennium Amitabh Bachchan. Hence when Badshah Khan aka Shah Rukh after his successful hit blaze of films like BAAZIGAR and DARR got the opportunity to click a picture with Amitabh Bachchan for the first time in the mid 90’s he had butterflies in his stomach. To win over the heart of superstar Amitabh Bachchan, the budding actor also became Bachchan Sahab’s hair dresser as Shah Rukh happily held a mirror towards Big B, while Bachchan gave touches to his final look. Another picture that made history was that of ‘Original’ Superstar Rajesh Khanna and his successor to the throne of Superstar Amitabh Bachchan coming together for a shot. 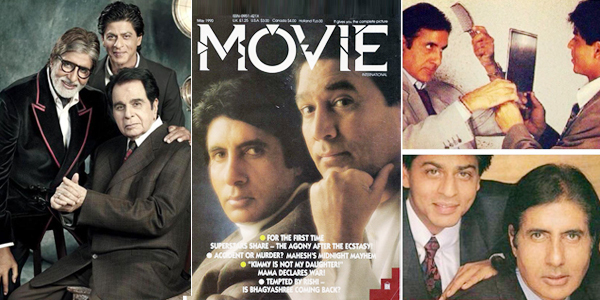 Finally the third picture which shall remain embodied in golden memories is that of three generation of Superstars coming together for the cover photo of Filmfare magazine, which celebrated 100 years of Indian Cinema. The trio of course is Dilip Kumar, Amitabh Bachchan and Shah Rukh Khan, truly a majestic movement! The shot was held at Dilip Kumar’s bungalow.